Buildings 21 and 23 were built using unbonded post-tensioning systems. Work on the structures had been temporarily suspended, and when it restarted it was found that numerous unbonded post-tensioning cables had been damaged whilst MEP work was being carried out. 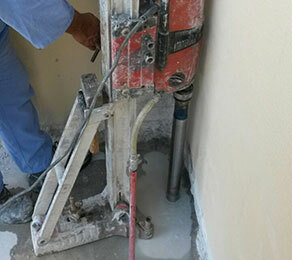 This was caused by coring and drilling the slab without correct coordination of the tendon locations. Although CCL was not involved in the original PT work on this project, the company was commissioned to carry out two phases of remedial work on the post-tensioned slabs. The first phase included site investigation and the preparation of a report for the client before undertaking the design. The second phase involved carrying out the repair and strengthening works on site. This was done by carefully removing the damaged cables, whilst leaving the plastic sheathing in place. New cables were then installed within the existing plastic sheathing, which remained embedded in the concrete.